Got some more new shop tools today. 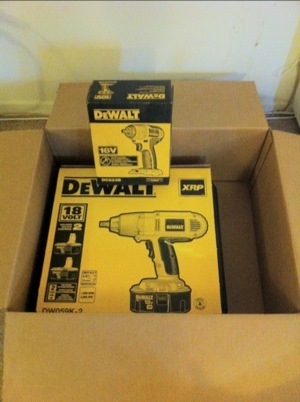 Dewalt 18v impact wrench set. They were on sale and with the purchase of 1/2″ drive impact wrench you received a free 3/8″ drive wrench. The deal was too good to pass up and I needed a new impact wrench since my snap on one was destroyed by someone that will remain nameless. ~ by B. Rogers on July 3, 2012. Tags: Dewalt 18v impact wrench shop tools 3/8" 1/2"